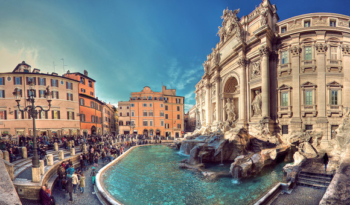 British Airways has announced a new route from London City to Rome, starting from 11th November. Flights operate from Monday to Friday, departing London City at 10.50 (arriving 14.20) and returning from Rome at 15.05 (arriving 18.35). There is also a Sunday service which operates later in the day. A fifth daily weekday flight to Zurich will be added from the same day. Four new Embraer 190 aircraft will be delivered to London City soon which will allow a new burst of route expansion. Further route announcements are on the way. As a new route, London City to Rome is wide open for Avios availability. Oddly there is NOT the ‘guaranteed’ four Euro Traveller and two Club Europe seats showing – all I see is two Euro Traveller seats per flight and zero in Business, irrespective of how far in advance I try to book. Before you book Club Europe, assuming you can find any availability, remember that British Airways does not have a lounge at London City and seating is 2×2 throughout the plane. The only extra benefit of note is the (far better than Heathrow) catering. That said, London City flights still offer free drinks and snacks in Economy too! PS. Remember that London City DOES have a lounge you can pay to use – in the Private Jet Centre next door. Here are our reviews of the London City First Class Lounge (which includes private security clearance and being driven to your plane – as long as it isn’t a BA plane) and our review of the London City Business Class Lounge. Hilton offering a McLaren track day for points! If you are keen on fast cars, Hilton Honors and McLaren have got together to organise an exceptional track day. Get ready for the ultimate McLaren Track Day experience at Dunsfold Circuit! You and your guest will have the opportunity to drive both a McLaren 570S and 720S alongside professionally qualified driving coaches. Your day will finish with a ‘hot lap’ where the driving coach will take to the wheel and show you how to maximise the cars performance around the track. Dunsfold Aerodome is a circuit designed to give a mixture of low and high-speed corners as well as a series of straights that will allow you to enjoy the McLaren road cars. This is also the “test track” of the BBC show Top Gear. If you know anything about performance cars you’ll know what an opportunity this is. If you don’t, it’s not for you anyway! At 275,000 Hilton Honors points, it isn’t cheap but it would be a great day out. There are three packages available at the time of writing. You can redeem here. The spacious guestrooms boast stylish, understated carpets and wallpaper in a neutral beige and taupe palette, contrasted by dark wood furniture detailing and a flash of colour from the hand blown glass turquoise lamps. “When designing an interior we integrate vernacular of the architecture and local surroundings,” explained Alan McVitty, Director of M Studio London. All flooded with natural light from floor-to-ceiling windows, certain guestrooms also boast scenic views over West India Quay whilst the Curve Suites showcase incredible sights across Canary Wharf’s skyline. Guestrooms have been decked out with luxurious flat screen TVs and plush mattresses, whilst suites come equipped with Nespresso coffee machines. Up-to-the-minute technology including high-speed Wi-Fi and 8 USB ports can be found in each room, ensuring ease for business travel. Even if you are not a business traveller, it is worth keeping an eye on this hotel as a good value tourist spot for a weekend break. It is just a couple of minutes walk from the Jubilee Line, dropping you in the West End very quickly, and the Docklands Light Railway literally runs past your window. As a redemption, it is now 35,000 points per night – a good deal, given the full refurbishment, compared to 50-60,000 points per night for the equivalent West End hotels. The Marriott West India Quay website is here if you want to find out more. NatWest Black drops Priority Pass for DragonPass - but is it worth £28 per month? OT – Weird goings on with my SPG card. My balance for transactions over the last month appears to have been adjusted for the change to Marriot points – I.e 3 for every £1 I spend. On £700 spend I’ve had 2,100 points. However, I’ve just hit the sign on bonus this month and had 11,000 points credited (10k + 1k referral). So my ‘starwood’ balance to be transferred, according to Amex is just over 13k. Shouldn’t this now be 33k points, or have they just devalued the sign-on bonus by a factor of three for me, as I was stuck in the middle during the changeover?! My current balance is a messy mix of old points and new ones. This website badly needs some sort of forum now. Came to the comments to see if there was much discussion about the McLaren offer, and nothing but 10 different OTs with people asking different questions. A small, simple forum would resolve this, and the comments can return to being comments. Are you volunteering to moderate it?! In general random stuff tends to go under a ‘Bits’ article. The other daily articles tend to have more structured comments.